The Fairey Gannet was designed and built in England in 1949 as a carrier borne anti-submarine aircraft. 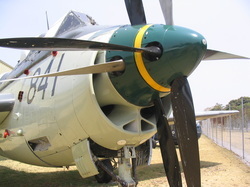 In 1955 No.816 and 817 Squadrons of the Royal Australian Navy Fleet Air Arm replaced their Firefly aircraft with Gannets. Around 40 Gannets were purchased by Australia and they served solidly, but unspectacularly, until 1967 when they were retired and replaced by Grumman Trackers. Most of the Gannets were destroyed as fire fighting dummies or as targets for live weapons training. 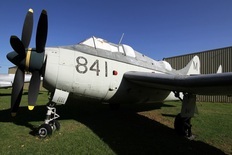 The Museum’s Gannet was stored at Bankstown Airfield in Sydney until put up for disposal by the Australian Government. The Museum purchased the aircraft and it was transported to Melbourne as deck cargo aboard the old aircraft carrier HMAS Sydney, at that time being used as a logistics support ship. This Gannet is one of only five to survive in Australia.